It hasn’t even been a year yet but it’s already that time when all things Hallyu are celebrated in one convenient location here in the States. After its first installment last August, KCON returned back again to the East Coast, bringing its M! Countdown concerts to the famous Prudential Center in the NY’s metropolitan area. 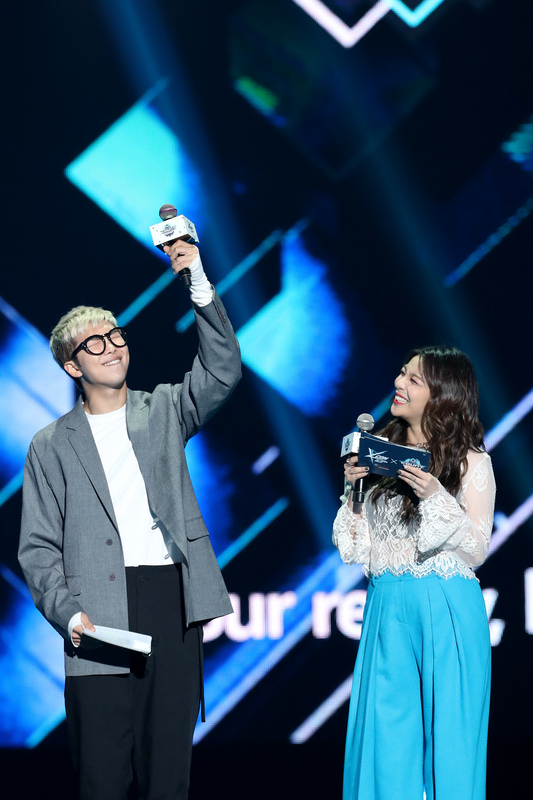 This time, not only did the convention grow from being a one day event to a two day event, spanning from June 24 to June 25, but KCON 2016 also saw a lot of new faces and talents. KCON 2015 NY felt like a pilot episode in comparison. On Day 1 of KCON 2016 NY alone, popular rookie group Seventeen met senior boy group BTOB at both their first KCON experience. Soloist Ailee drew both female and male Korean pop fans in throngs, while Amoeba Culture’s Crush and Dynamic Duo made their second KCON appearance and welcomed Korean hip-hop philes to the 18,000+ seat venue. The roster this year was a significant upgrade from last year, which haphazardly seemed to throw together a bunch of repeated acts from previous cons. What’s more, the lineup for KCON 2016 offered more diversity, reflecting the careful planning that went into maximizing concert turnout (as of now, the attendance is still TBA). But the music is just one aspect of Hallyu, with K-Drama as another. A new addition to KCON 2016 NY was the special guests, which included idol actor Yim Siwan (“Triangle,” “Misaeng”) and actress Park Bo Young (“A Werewolf Boy,” “Oh My Ghostess”). Together, the two stopped by the South Korean entertainment network tvN booth during the convention and acted as special MC’s for a segment of the night, giving the regular hosts a break. 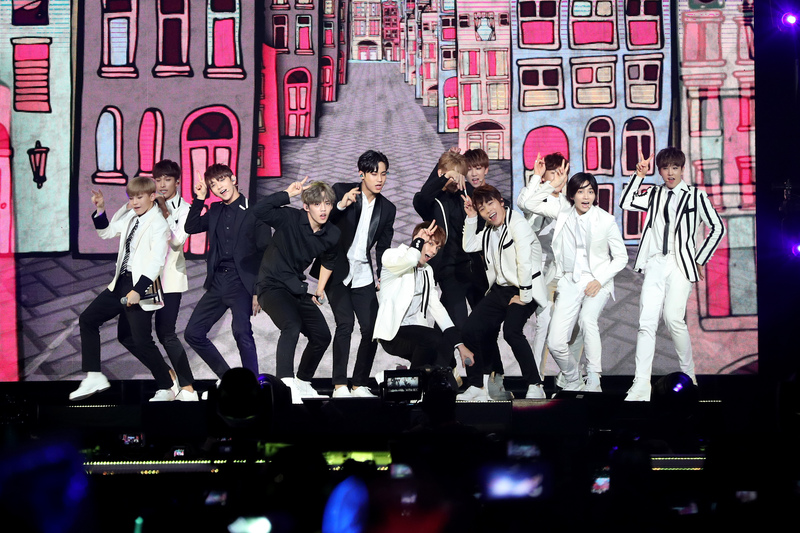 Emerging out of 2015 as one of the hottest rookie groups, Seventeen didn’t fail to deliver a remarkable performance. Under the dim lights, a VCR of the members dancing to the intro song “Shining Diamond” segued into the real deal. A chorus of screams at the appearance of 12 (rapper Wonwoo is sitting out of promotional activities at the moment due to health problems) half clothed in black, the other in white, indicated that the show was finally underway. They wasted no time as they dove right into their latest hit “Pretty U,” blithely working a couch into their choreography in front of a color pop of city streets backdrop. They really set the standard for the following track, the EDM-trap mix “Chuck,” which varied stylistically from the musical-esque number from before, but still sustained the same austerity of in-sync choreography. To finish off their half-hour set, the boys threw it back to the classics that shot them to where they are now (though would it be much of a throwback if it was only to last year?). Starting with “Mansae,” the audience transformed into a sea of arms swaying to the beat of the “mansae,” the point choreo that the members took time out to teach beforehand. It’s always a welcome sight to see the union of fans and artist, even if it’s just in such a simple gesture as waving an arm. Even in “Adore U,” which marked the end of their set, there’s that familiar point dance – a literal point dance – during the hook that’s easy enough for even the average caveman to follow. When they are on stage, Seventeen just exuberates overflowing youth and spryness. The only drawback to this, however, is because they are still maturing as a group, they are still stuck playing by the books, which means they couldn’t make full use of the stage that was given to them. A forgiving qualm, though, for the group with the insane vocals and an entertaining live show to boot. Being a soloist on a stage of such a grand scale is always going to be nerve wracking. Projection becomes all the more important, and hyping the audience up requires extra effort. Fortunately for Crush, he’s got that covered, and all in just a-less-than-usual three songs too. No introductions were needed here for the R&B singer who went straight into his 2014 slow jam “Sometimes” as soon as the music cued him to the stage. From start to finish, he single-handedly turned the M! Countdown concert into a lounge party, belting out a string of long notes and ad libs to a round of cheers in the process. Besides his interesting Canadian Tuxedo x French beret collaboration that he donned – which must be a fashion faux pas in at least ten different cultures – the guy really did no wrong. “Sometimes” was only warm-up for what’s to come. The palm leaves that decorated the LCD displays behind him were very appropriate for the summer vibe-y single “Oasis.” Crush even revealed his knack for rap when covering for an absent Zico in his “It G-Ma”-styled verse, during which he doused crowds with bottled water while jumping around on the extended stage. By this time, the crowd was already so amped up that his request for the audience to put their hands up seemed superfluous. This revelry continued well into “Hug Me,” which featured help this time from Dynamic Duo’s Gaeko, and even more of a water show. Things were only now just getting heated. Ailee’s just one of those artists where even if you are not a fan, you are a fan. Her vocal prowess cannot be denied, and she was able to demonstrate it once again during an incident that happened while she was performing her routine to “Mind Your Own Business.” About halfway through the song, a technical malfunction caused the backing track to stop, leaving a visibly rattled Ailee to finish her verse acapella. Audiences applauded her diplomacy, even when she stepped backstage to resolve the issue (one concert go-er in my section made the snide remark that someone was getting fired that night) and when she came back for her second take. “This has never happened to me before,” the New Jersey native says before making light of the situation and viewing the glitch as a welcome home gift. One thing remains certain, and it’s that we can at least count on Ailee to provide fans with honest stages, which is something that cannot be said about all idols in the K-pop industry. After going through both break-up power anthems “Don’t Touch Me” and “I Will Show You,” the diva also disclosed how nervous she was to perform that night (“I’ve never been nervous before, not even my debut performance, not even my first solo concert”) in front of all her friends and family for the first time, all the while holding back tears. The sincerity of her words compounded by the overall pathos of her homecoming were probably what compelled audiences to stand for her closing song “U & I.” Fans could not even be pressed that she did not perform “Q&A” with Seventeen like some thought she would. Cute as it may have been, this was all about her. Ever since their first music show win with “It’s Okay,” BTOB has swapped out their charismatic boy band image for something more softcore, which has still been working out in their favor. Presented by an enchanted forest visual display and a LCD light show that signaled the coming in of the members clad in rose quartz suits, they opened with the ballad “Remember That,” riding on the same success the aforementioned “It’s Okay” amassed for them. Rappers Minhyuk and Ilhoon still served with their subdued raps, while the vocalists never once faltered in their department. The group also filled their slots with their lesser known singles, such as “All Wolves Except Me” and “Beep Beep,” the former a jazzy swing track bursting with all kinds of brassy sounds and the latter a similar funky saxophone-centric piece that seem more in line with their personalities. The youngest member Sungjae even worked in some aegyo (a cute display of affection), sneaking a quick “bbyu” before the lights lowered, causing fans to giggle. 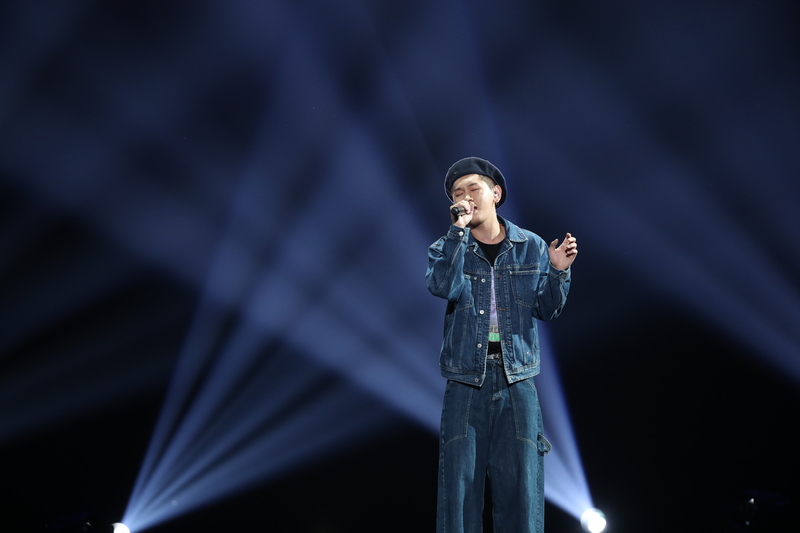 Personally, the main highlight of their stage wasn’t even their live performances off of their own discography, but their impromptu rendition of One Direction’s “History.” As if he was not already savvy in the art of rap, main rapper Ilhoon wowed the audience with his overwhelming high notes. Sometimes it is actually stressful how underrated this group is, but hopefully KCON bringing them out for the first time will lead to future invites and more recognition. …Then you probably did after seeing their special stage. Part of the appeal of KCON’s “M! Countdown” concerts are their exclusive performances in which the acts cover the hits of others or collaborate together to produce something greater than the sum of their parts. This year, in a phenomenal medley Seventeen returned back to the stage with a cover of After School’s “Bang,” the bop that made being in a marching band cool again. They even looked the part in their ornamental navy military jackets topped with epaulettes, cheering “S-V-T” with Pledis pride. This transitioned smoothly into a modern, more synth-y (if that’s even possible) version of Super Junior’s “Sorry Sorry.” It may not be the first time the group has shown us their spin on the iconic dance (check out their “Weekly Idol” appearances), but it’s exciting nevertheless seeing it done on American soil. To wrap it all up, Seventeen paid homage to the reigning kings of K-pop TXVQ with their bubbly render of the 2006 song “Balloons,” which is, like, oh my god, the last time they did this was when they were still trainees shooting for their mini series “Seventeen TV.” Not tied down by any choreography, the twelve were finally able to make full use of the extended stage, merrily greeting their U.S. fans for the first time. Debuting in 2003, Dynamic Duo made the most sense as headliners. But more than just seniority, they also possess the attitudes and the finesse of a headliner. Before they even stepped foot on stage, their digital selves were already initiating a call and response tactic, asking “Who Are We?” followed by concert attendees hollering out their names. When they did make their noble entrance, they came in full-force from the get-go with “BAAAM,” employing more call and response approaches. Jiving freely to the upbeat tempo that the DJ on stage was mixing, they had genuine fun on stage and the audiences reciprocated that. By the time they were performing the EDM infused hip-hop jam “Shoot – Goal In” the crowd were already on their feet, dancing in place. 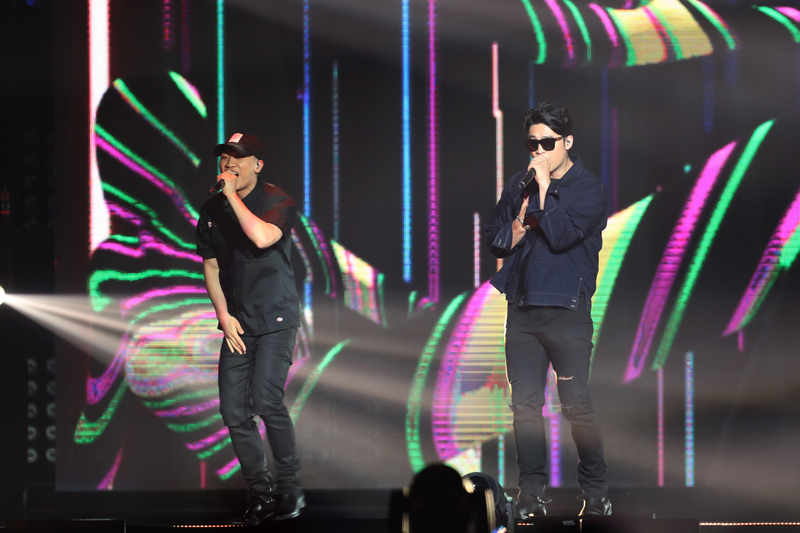 Again, who knows how many folks actually knew the song, never mind the lyrics, but the manner in which members Choiza and Gaeko were able to hype each other up (e.g. – rapping to each other as opposed to with each other, echoing each other’s words, etc.) was entertaining to watch and exhibited real artistry. The rest were an honest blur. The duo picked up enough momentum and was not about to break it as they went straight into Gaeko’s own percussion based “Rhythm is Life.” When the time came to conclude the night already, they were bouncing around to their dance party anthem “Friday Night,” which could it be any more fitting? In the midst of the smoke and light sticks, the place was a full fledge rave, and everyone was high. And with the customary shower of confetti, Day 1 of KCON 16 NY was over. A vast improvement from last year’s KCON NY, it really set the bar high for future ones. One day of KCON NY fun still remains, however, who knows what will happen then? 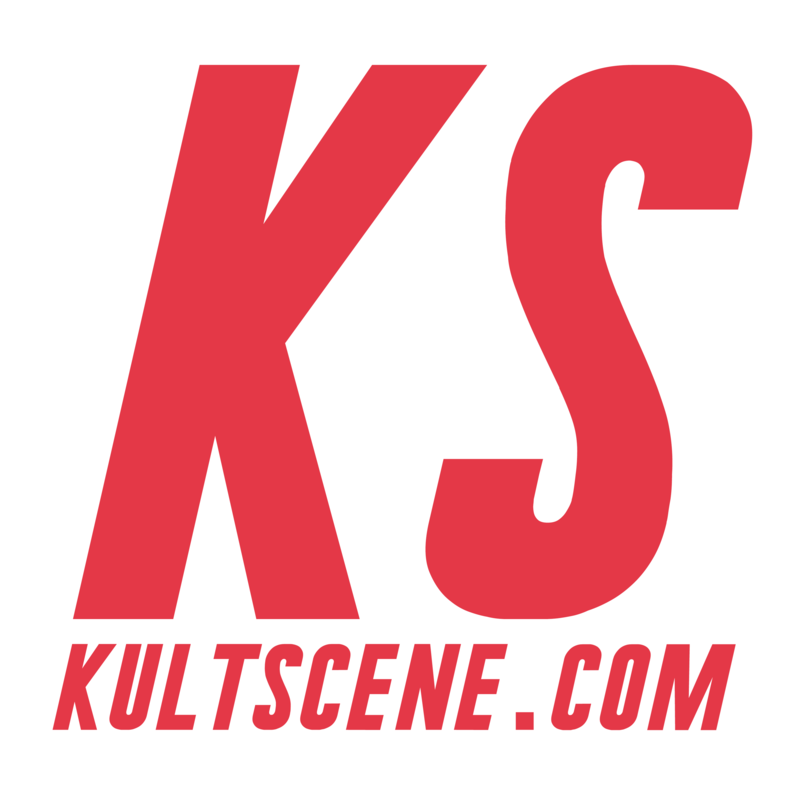 Did you attend KCON 16 NY? What’s your favorite KCON artist? Let us know in the comment section below and be sure to subscribe to the site and follow us on Facebook, Twitter, Instagram, and Tumblr to keep up with all of our posts.